As I was paying for our groceries at the grocery store yesterday, off in the distance I heard someone yelling quite frantically, "Wait, wait, wait!" Lo and behold it was Hubby. 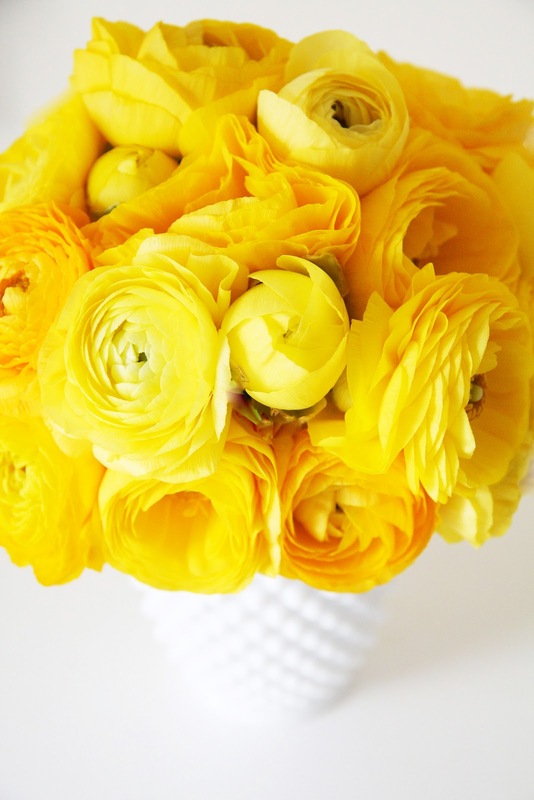 As he got closer, I could see that he was grasping two bunches of beautiful yellow ranunculus to his chest. Thrusting the flowers at the cashier, he turned to me with exasperated relief and said, "I can't believe I almost forgot the flowers!" Hug that man for me. He is awesome...and so are those amazing flowers- wow to both. I just ordered my spring bulbs, ranunculus were at the top of my list, I can't wait til they flower! Oh my, I just adore this photo! I will have to see if I can find some yellow ranunculus too I think. I had never heard of these beautiful flowers until I read you post last week..I have since ordered 100 bulbs..fingers crossed.. I just found your blog - So excited - I live in a 249 year old Farmhouse! You have done a beautiful job - I have been considering painting mine white - and I think your photo has convinced me! Beautiful! I brought some white ones home the other day! Such a gorgeous flower and perfectly charming husband! Before I knew anthing about gardening, it was your yellow ranunculus I thought I would plant and have blooming all year. Also thought I could have lupines & delphinium. Love that man! The yellow is beautiful beyond words!!! Your husband is definately a keeper! My husband just looks at flowers (when I make him) at the store and always says they aren't on the list. What a sweet guy you have and he chose the flowers well too. They are beautiful! Porch paint is Benjamin Moore Porch & Floor - color Platinum Grey. I just happened by your blog today and I love it. The hubs and I just moved to the country last August, and we are also living in what was once a farmhouse. I'll be back to find more inspiration here. I find that pace of our lives has slowed down in the most delicious way. Flowers are beautiful. Story is fabulous! I love it! This post was a perfect follow up to the white ranunculus. The flowers are just gorgeous. I'm so jealous! They are beautiful! I have been searching all of the grocery stores in my area and have found NONE of these flowers. Don't they just look like Spring? Ranunculas are so beautiful, altho the bulbs look shriveled up. You have a honey of a husband. p.s. We live near Carlsbad Flower Fields. You would love those, I know. How funny! I just posted last night about my husband NOT bringing me flowers - but salvaged roadside "junk" instead -and how much I love it! Nope, no flowers from that guy - but he still know that fastest route MY heart! That was hilarious! I needed a good laugh today....thanks! How sweet. My hubby loves gardening and flowers too, although I need to introduce him to ranunculus. They are beautiful! Such a cute story... so he really did that or truthfully was it you>? Lolol I absolutely LOVE your wit! My beloved 1st motherinlaw ( may she rest I peace) had a very similar sense of humor. She would get the cutest twinkle in her eye when she would say witty things. Something tells me that you might have been known to twinkle too! Btw those flowers are spectacular. Your grocery store flowers are drop dead gorgeous!!! I love the humor of your story here. But I admire most the flower. The color is very alive. Excellent photography too. It's good to know my hubby is not the only one. I have ranunculus blooming in my garden. I was so excited to see to see them blooming after all the rain. I thought when I told him for sure he would feel the same, but all I got was "That's nice." Still I can't wait to paint them. Ranunculus make me weak in the knees! The flowers are beautiful and the story behind the purchase made me laugh :) My husband would never think of buying flowers "just because" either! Those flowers are amazingly beautiful; just LOVE ranunculus, especially yellow. Your husband is a good man; hope you tell him frequently; hope he tells you, you're a good woman. All too soon it's nothing but memories. SO gorgeous... I don't think I've ever seen them for sale in bouquets! I love ranunculus, too, and I never could have spelled it without your help! I don't see them much where we live, in Ohio. Wonder if they can grow here or is it a different zone? I love your blog and have added you to my Meaningful Blogs list on my brand new blog! People are easy to fool ;) I knew you were kidding, it made me laugh! How beautiful those flowers are. These flowers are a picture, literally and figuratively.